Congrats to Randy for winning our 2013 Truck of the Year Poll! It is such an honor to have my truck selected and joining such an amazing group of trucks and owners here at the FTF. I bought this 1976 F-250 Ranger Camper Special in January 1981 for the specific purpose of towing close to 12,000 lbs. of grading tractor and trailer for my new business of doing construction and landscape final grading. It was a job she did very well for over 25 years and 351,000 miles. My truck is set-up for heavy duty towing with the biggest improvement to it's capabilities coming in 1999. That is when I had a 460 built and stroked to 557 c.i. by a very well respected engine builder in our area. My truck is not a show truck, she is an old well loved work truck that has more than earned her keep over the years. I used to own an Auto Parts store and a long time ago a customer came in looking for a rebuilt engine for his daily driver and I knew he had this ’51 f1 so I offered to trade him the engine for the truck and he took me up on it. It wasn’t until three years ago that I decided to start on it and I just happened to have a old Ford wagon with a 460 in it and a nine inch in the scrap pile that I have no idea where it came from that was just the right width, every hundred times things just work out. I had an idea of what I wanted to do and with the patina and the door art, three years and a lot of money, I think I got there. My truck is a 02 Super Crew with 11" of lift, 38" Toyos on 18x12 Revolvers, 5.4 Tuned and programmed, a K&N Cold Air Intake, Eagle Eye Lightning Heads with 55watt 6000k Bi-xenon, 55watt 6000k in the fogs, 4.10 Yukon gears front and rear with a Detroit Tru Track Posi Unit, and 2012 Badges. Thanks again it's a honor. 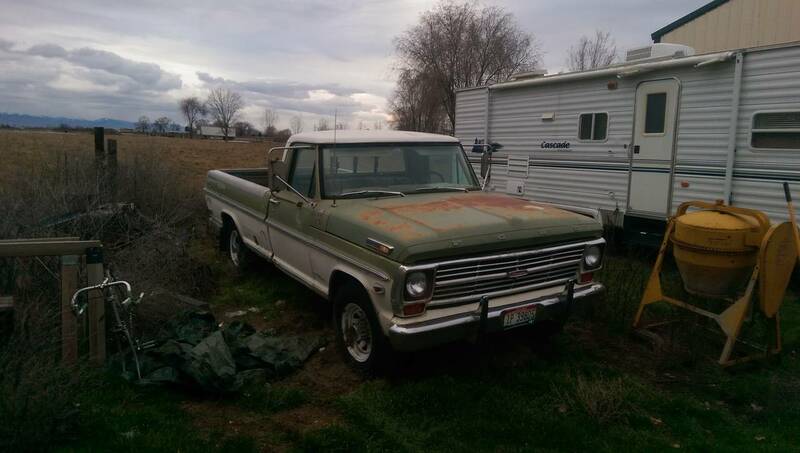 'Ol faithful started out life as a 2wd f100 302 3sp truck. When I got it from my wife for a 30th B-day gift it had a 460 c-6 that I ran for years, even did some drag racing with it. Back some 5 years ago we did a frame swap to a 71 f250 4x4 frame. It sat for the next 5 years out in the junk row waiting for us to do something with it. It had a 390 in it when we swapped bodies and it went tight over the years. We pulled that and stuck in a 300 I-6 with a 4sp and finished it up so we could have some fun with it. Now we use it for fishing and hunting trips along with haulin' wood even a lil truck pullin'. 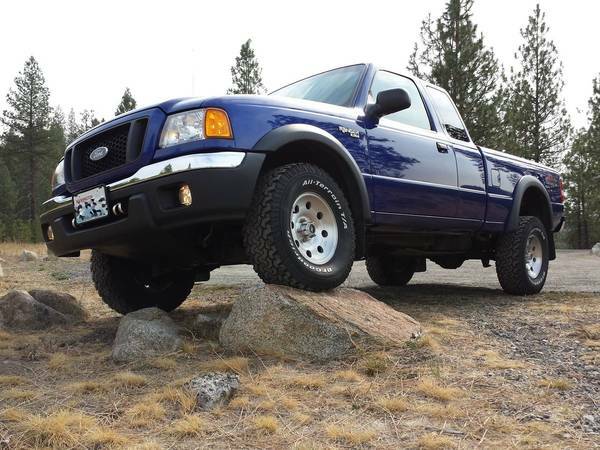 "This is my 2006 Ford F-250 Amarillo; it has the 6.0 liter Powerstroke Diesel V8 with a Torqueshift automatic transmission and a 3.73 limited slip rear axle. With the Amarillo package you receive just about every option available on a Lariat truck along with an unique interior, bedside decals, and of course the signature yellow paint. I purchased this truck in May of 2013 with a little over 120,000 miles at Lutesville Ford in Marble Hill, Missouri. 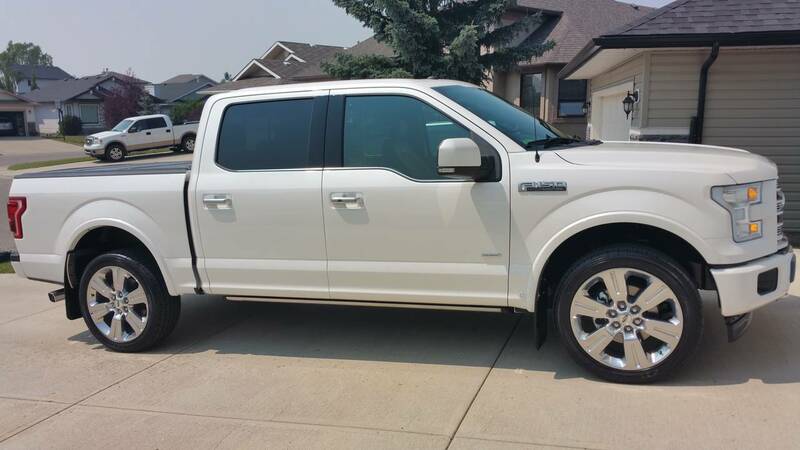 I searched many months to find the right truck, and actually went to the dealer to look at a different truck. If you’ve ever had an opportunity to drive a Super Duty of this body style you probably made note of how well the interior is laid out with everything at your fingertips and ergonomic surfaces. The interior quickly became a real highlight of the truck for me, something I never expected, it truly makes for a pleasant driving experience. The truck is all stock except for the tires, which are 295/70-R18 Nitto Trail Grapplers which really go along with the yellow paint and the tone of the 6.0 to add yet another layer of aggressiveness to the truck. I plan in the future to perform the high idle mod and add a coolant filter. Lastly, I’d like to thank the entire FTF staff for having my truck be the August truck of the month." I bought the truck about 2.5 years ago from the original owner’s grandson. 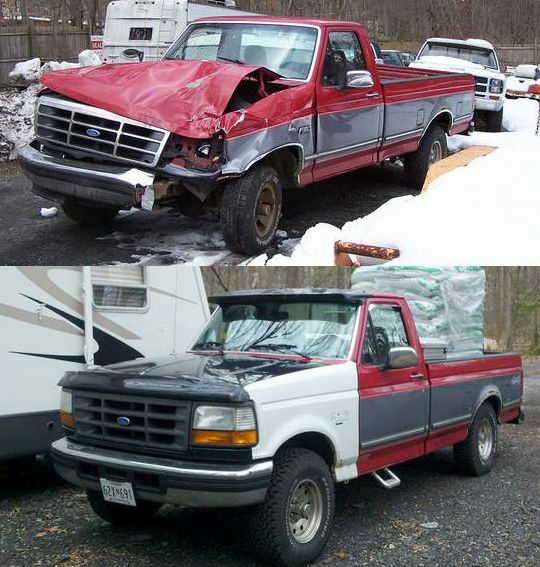 He had gotten the pickup after he passed away and it was sitting in a shed for about 18 years. His grandfather was a farmer in southern MN and bought the pickup brand new in 1978. •	Came with a running straight 6, swapped for a 351w. About me- 25 years old, born and raised in Mankato Minnesota where I graduated college with a degree in construction management.I am currently working for a large international contractor based out of the twin cities. I am on a project in Baton Rouge Louisiana. Fixed up my first Ford with my Father when I was 15 years old, it was a 1987 but I always wanted a 78-79. Unfortunately the truck is still in MN while I am down here, but I have to stored at my parents place and my dad likes to tinker on it and take it for a spin every once and awhile. It gets about 200 miles a year. Thanks for naming my truck as Truck of the Month. It's a real honor, especially coming from the great community that is made up of the members on this site. 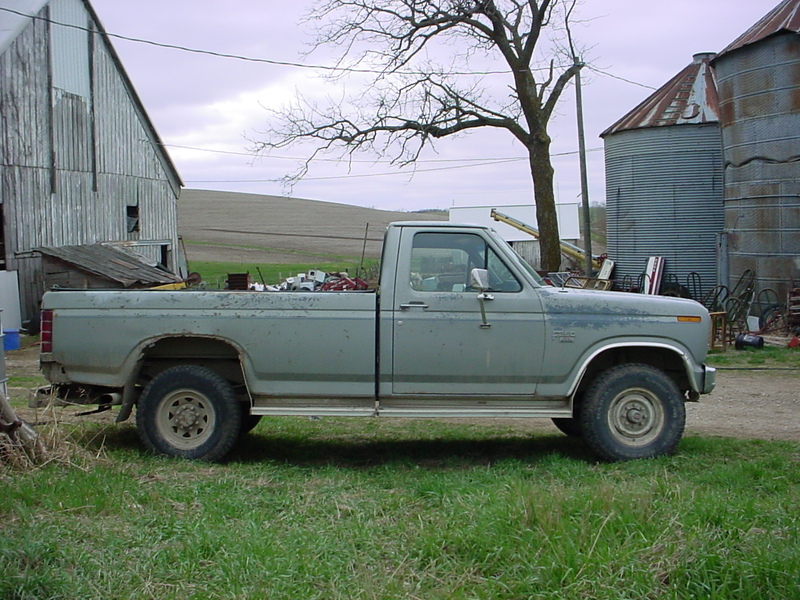 The truck is a 1979 Ford F250 4x4 with a 351M and Borg Warner granny-gear four-speed. It has 4.11 gears and the NP 205 part-time transfer case. As you probably know, I call her the Jolly Green. The old motor has been rebuilt and worked over to wake it up with an upgraded cam and timing set. It also has dual exhaust with a nice, lopey rumble through a pair of Dynomax Super Turbos. That's the only mods to it, and with those upgrades alone it produces a surprising amount of power for an engine with a less then gleaming reputation from the factory. 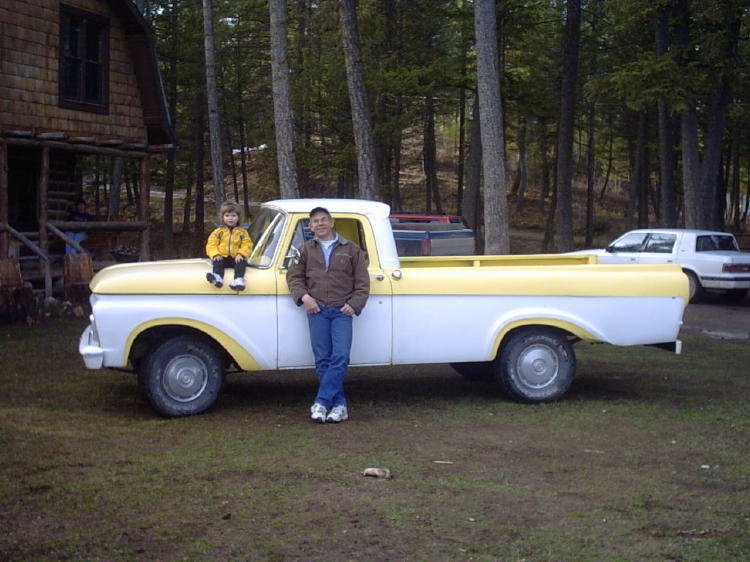 I bought this truck in 2008 from a guy that had a partial restoration done on it in 1996. It worked, for a time, as his company truck for his own business. He used all original Ford parts in the rebuild, which I verified before purchase. Its appearance as a Ranger with the trim and tu-tone paint is not original – it was done to the previous owner's taste…but he had good taste. However, it's originally a Custom with Explorer Package, and the build sheet tells me it came from the factory in solid Dark Jade Metallic with the Explorer stripe kit, and no bright work. The matching green carpet, seatbelts, and sun visors from the Explorer package remain intact. I’ve had the seat recovered out of necessity. This truck still earns her keep. On the day this description was written, I hauled yet another ton of top soil in it. I take the best care of the truck that I can, but love using it way too much to not work it when the need for a truck arises. She has a few dings, but they all came honestly. 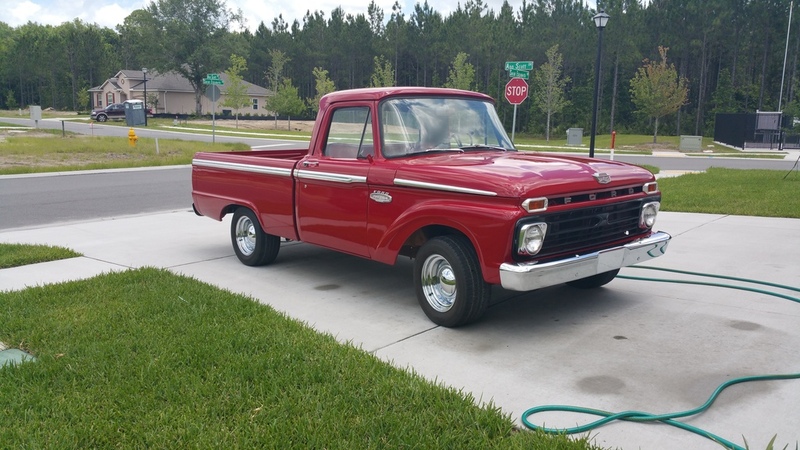 I grew up riding in my dad's '78 F150, and learned to drive in it. It was hard on both of us when he felt he had to get rid of it because it was showing too much age. So, years later, I had to get another dent side. Here she is! I have owned this 1952 Ford Panel for eights years. It was a father-son project that was sold to me after it was completed. The truck now has the original (rebuilt) OHV 215 6 cylinder motor. The truck retains its stock appearance, except for the wide whitewall tires. This Panel truck is a great hit wherever it goes. 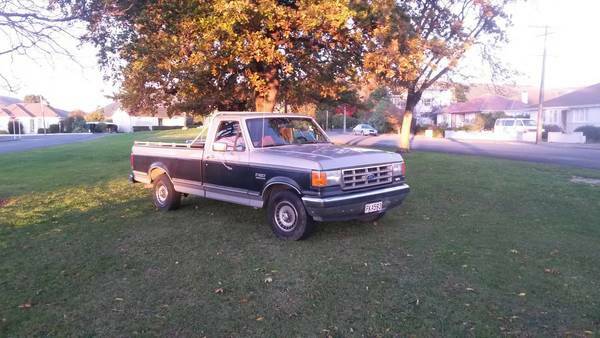 The truck is an 87 f250 with a 7.3 turbo diesel in it, it has a 21in lift d60 kingpin frt and a sterling 10.25 rr, they have 5;13 gears with detroit lockers frt & rr, the outer axles are 4340, the 1345bw transfer case has been clocked, ladder bars frt & rr, 19.5x54-20 Boggers on 20x14 fuel hostage wheels. The FTF TOTM for February 2013 is probably one of the cleanest daily driven F-150's on the planet, dixie_boysles 2004 F150 Lariat Supercab 4x4. I bought this truck as a baby hauler lol. "It is with great honor and pride that I receive the coveted TOTM award (and the bragging rights associated) Seriously, I doubt I'd waste as much time as I do without the FTF family! Anywho, I passed this 03 King Ranch one day on my way to work; a buddy of mine had it on his lot. I turned around to take a look - she had to be mine at first glance!! I could care less that it's a 2wd, or it has 220,000 miles because of one perfect feature... heated seats! As she sits today I've replaced the grille with a Grillcraft mesh piece, HD turn signal housings, and of course some FTF advertising on the back glass."